Her father was president of the Parliament of Burgundy, and leader of the royalist party during the League that brought about the triumph of the cause of Henry IV. In 1592 she married Baron de Chantal, and lived in the feudal castle of Bourbilly. She restored order in the household, which was on the brink of ruin, and brought back prosperity. During her husband's absence at the court, or with the army, when reproached for her extremely sober manner of dressing, her reply was: "The eyes which I must please are a hundred miles from here". She found more than once that God blessed with miracles the care she gave the suffering members of Christ. St. Francis de Sales' eulogy of her characterizes her life at Bourbilly and everywhere else: "In Madame de Chantal I have found the perfect woman, whom Solomon had difficulty in finding in Jerusalem". Baron de Chantal was accidently killed by a harquebus while out shooting in 1601. Left a widow at twenty-eight, with four children, the broken-hearted baroness took a vow of chastity. In all her prayers she besought God to send her a guide and God, in a vision, showed her the spiritual director He held in reserve for her. In order to safeguard her children's property, she was obliged to go and live at Monthelon in the home of her father-in-law, who was ruled over by an arrogant and wicked servant. This was real servitude, which she bore patiently and gently for seven years. At last her virtue triumphed over the ill will of the old man and house keeper. During Lent, 1604, she visited her father at Dijon, where St. Francis de Sales was preaching at the Sainte Chapelle. She recognized in him the mysterious director who had been shown her, and placed herself under his guidance. Then began an admirable correspondence between the two saints. Unfortunately, the greater number of letters are no longer in existence, as she destroyed them after the death of the holy bishop. When she had assured the future security of children, and when she had provided the education of Celse-Benigne, her fourteen year old son, whom she left to her father and her brother, the Archbishop of Bourges, she started for Annecy, where God was calling her to found the Congregation of the Visitation. She took her two remaining daughters with her, the elder having recently married the Baron of Thorens, a brother of St. Francis de Sales. Celse-Benigne, impetous like those of her race, barred his mother's way by lying across the threshold. Mme de Chantal stopped, overcome: " Can the tears of a child shake her resolution? " said a holy and learned priest, the tutor of Celse-Benigne. "Oh! no", replied the saint, "but after all I am a mother!" And she stepped over child's body.The Congregation of the Visitation was canonically established at Annecy on Trinity Sunday, 6 June, 1610. Its aim was to receive, with a view to their spiritual advancement, young girls and even widows who had not the desire or strength to subject themselves to the austere ascetical practices in force in all the religious orders at that time. St. Francis de Sales was especially desirous of seeing the realization of his cherished method of attaining perfection, which consisted in always keeping one's will united to the Divine will, in taking so to speak one's soul, heart, and longings into one's hands and giving them into God's keeping, and in seeking always to do what is pleasing to Him. "I do always the things that please him" (John, viii, 29). The two holy founders saw their undertaking prosper. 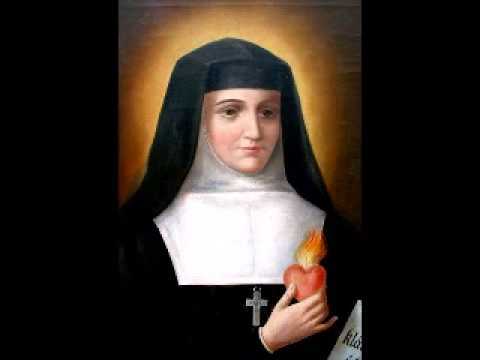 At the time of the death of St. Francis de Sales in 1622, the order already counted thirteen houses; there were eighty-six when St. Jane Frances died; and 164 when she was canonized. The remainder of the saint's life was spent under the protection of the cloister in the practice of the most admirable virtues. If a gentle kindness, vivified and strengthened by a complete spirit of renunciation, predominates in St. Francis de Sales, it is firmness and great vigour which prevails in St. Jane Frances; she did not like to see her daughters giving way to human weakness. Her trials were continuous and borne bravely, and yet she was exceedingly sensitive. Celse-Benigne was an incorrigible duellist. She prayed so fervently that he was given the grace to die a Christian death on the battle-field, during the campaign against the Isle of Re (1627). He left a daughter who became the famous Marquise de Sevigne. To family troubles God added interior crosses which, particularly during the last nine years of her life, kept her in agony of soul from which she was not freed until three months before her death. Her reputation for sanctity was widespread. Queens, princes, and princesses flocked to the reception-room of the Visitation. Wherever she went to establish foundations, the people gave her ovations. "These people", she would say confused, "do not know me; they are mistaken". Her body is venerated with that of St. Francis de Sales in the church of the Visitation at Annecy. She was beatified in 1751, canonized in 1767, and 21 August was appointed as her feast day.